Colored coded folders with full-length write-on tab help you divide, organize and color code projects. Colored folders with full-length write-on tab help you divide, organize and color code projects. Heavyweight acid-free polypropylene. Write-on tab for easy identification; works with pencil, ball point pen or permanent marker. Open two sides for easy access. Unique gusseted corner design allows folders to expand to hold up to 100 pages. Reduced glare. For 11 x 8-1/2 document storage. 10/PK. Assortment includes 2 each yellow, red, blue, gray, green. I'm John at C-Line, and today we're going to talk about our Colored Project Folders with Write-On Tab. Divide, organize, and color code projects with these colorful project folders. The full length tab provides more space for writing. Simply use a pencil, ball point pen, or permanent marker to label your folder. The Colored Project Folders are opened on two sides for easy access and have a unique gusseted corner that expands to hold up to 100 pages. 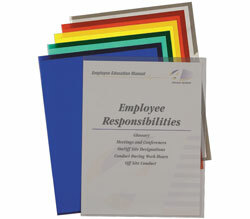 These durable folders are made from heavyweight archival quality polypropylene and fit letter size documents. They are great for organizing files and information at your home, school, or business. Get organized and quickly identify projects with our Colored Project Folders with Write-On Tab. Order yours now! That's all we have for today. I'm John at C-Line, thanks for watching.